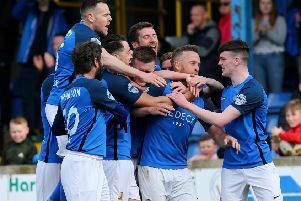 Positivity in the key to success for new Carrick Rangers manager Aaron Callaghan. And a draw in his first game was at least a step in the right direction as it ended a run of seven straight league defeats. “The thing we had to do was to grind out the result. We battled and kept our shape well,” he said. Although it was the visitors who started the brighter, Carrick who had the first real opportunity when Adam Salley found himself one-on-one with Jonny Tuffey but the youngster shot wide. Glenavon should have been one up before the interval but Eoin Bradley somehow missed an open goal when played in by Andrew Hall. After the break the ex-GAA frontman had two clear-cut chances in as many minutes but he couldn’t get the better of the excellent Brian Neeson. And Carrick almost snatched a winner in the final minutes – following the sending off of ex-player Andrew Doyle – when Mark Surgenor headed wide.